I am conducting a test on wasting money on a outdated computer. Plus I want to play bf2 with a slightly faster cpu. Can someone check and or mod a bios to make sure the computer will see the new cpu? Currently the m11xr1 has 2 options for cpu, su7300 and su4100. 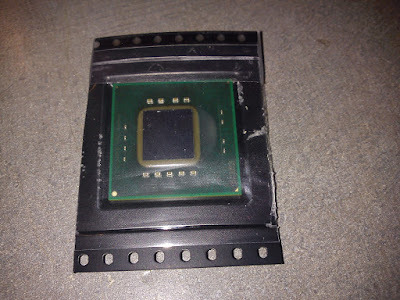 pic of new cpu robbed from the assembly line. If you ask me, it looks like your bios already has a microcode which should work (but I'm not the best person to do this sort of check). Anyway you can actually wait until the CPU is swapped before you need to update the bios. Reason is because if you have the wrong microcode, the notebook should still pass POST, it will just give you a warning. You can see an example of the problem at http://forum.notebookreview.com/7092089-post1490.html. Solution at http://forum.notebookreview.com/7094893-post1504.html. Confirmation the problem fixed at http://forum.notebookreview.com/7095085-post1506.html. If notebook doesn't boot with CPU in question & didn't get the Microcode Update error message as illustrated above, BIOS mod with CPU Microcode Update will not fix the problem." Kizwan is one of the best (if not the best) bios modders online (he is also a member of this forum). 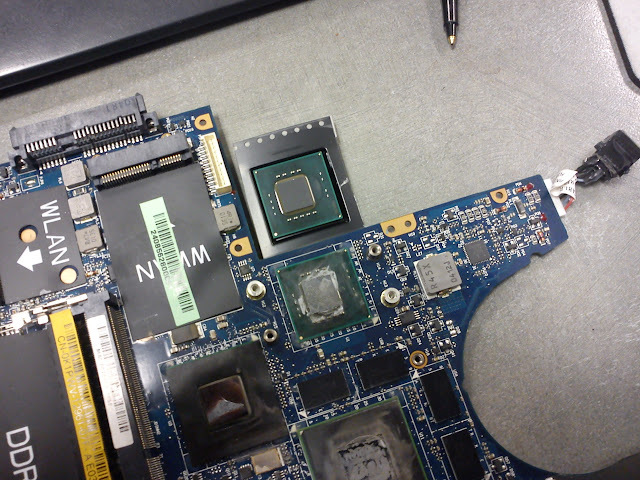 The motherboard is going into the shop today at around 3:30 to have the cpu soldered into place. Here is a picture of the 2 chips next to each other. I will update when I get it all put back together and if its running.